Infobox newspaper image param needs updating, Articles incorporating text from Wikipedia, Media of the military of the United States, Newspapers published in Washington, D.C.
Stars and Stripes is an American newspaper that reports on matters affecting the members of the United States Armed Forces. It operates from inside the Department of Defense, but is editorially separate from it, and its First Amendment protection is safeguarded by the United States Congress, to whom an independent ombudsman, who serves the readers' interests, regularly reports. As well as a website, Stars and Stripes publishes four daily print editions for the military service members serving overseas; these European, Middle Eastern, Japanese, and South Korean editions are also available as free downloads in electronic format, and there are also seven digital editions. The newspaper has its headquarters in Washington, D.C.
On November 9, 1861, during the American Civil War, soldiers of the 11th, 18th, and 29th Illinois Regiments set up camp in Bloomfield, Missouri. Finding the local newspaper's office empty, they decided to print a newspaper about their activities. They called it the Stars and Stripes. Today, the Stars & Stripes Museum/Library Association is located in Bloomfield. During World War I, the staff, roving reporters, and illustrators of the Stars and Stripes were veteran reporter or young soldiers who would later become such in the post-war years. Harold Ross, editor of the Stars and Stripes, returned home to found The New Yorker magazine. Cyrus Baldridge, its art director and principal illustrator, became a major illustrator of books and magazines, as well as a writer, print maker and stage designer. Sports page editor Grantland Rice had a long career in journalism and founded a motion picture studio called Grantland Rice Sportlight. Drama critic Alexander Woollcott's essays for Stars and Stripes were collected in his book, The Command Is Forward (1919). The Stars and Stripes was then an eight-page weekly which reached a peak of 526,000 readers, relying on the improvisational efforts of its staff to get it printed in France and distributed to U.S. troops. 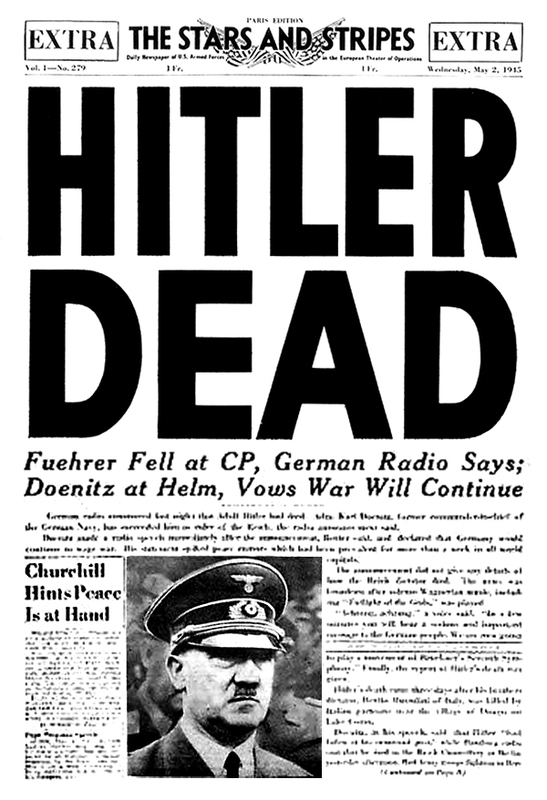 On May 2, 1945, Stars and Stripes announced Hitler's death. During World War II, the newspaper was printed in dozens of editions in several operating theaters. Again, both newspapermen in uniform and young soldiers, some of whom would later become important journalists, filled the staffs and showed zeal and talent in publishing and delivering the paper on time. Some of the editions were assembled and printed very close to the front in order to get the latest information to the most troops. Also, during the war, the newspaper published the 53-book series G.I. Stories. After Bill Mauldin did his popular "Willie and Joe" cartoons for the WWII Stars and Stripes, he returned home to a successful career as an editorial cartoonist and two-time winner of the Pulitzer Prize. Former Stars and Stripes staffers also include 60 Minutes’ Andy Rooney and Steve Kroft, songwriter and author Shel Silverstein, comic book illustrator Tom Sutton, author Ralph G. Martin, painter and cartoonist Paul Fontaine, author and television news correspondent Tony Zappone, cartoonist Vernon Grant (A Monster Is Loose in Tokyo), Hollywood photographer Phil Stern and the late stock market reporter and host of public television's Wall Street Week, Louis Rukeyser. A photograph in Stars and Stripes loosely inspired the exploits of PFC Jack Agnew in the 1965 novel and the 1967 film, The Dirty Dozen. The newspaper has been published continuously in Europe since 1942 and in the Pacific since 1945. American comic strips have been presented in a 15-page section, Stripes' Sunday Comics. Stars and Stripes being delivered to US troops, 2003. Stars and Stripes is authorized by Congress and the US Department of Defense to produce independent daily military news and information distributed at U.S. military installations in Europe and Mideast and East Asia. It is not distributed within the United States. Stars and Stripes newspaper averages 40–48 pages each day and is published in tabloid format and online. The newspaper employs civilian reporters, and U.S. military senior non-commissioned officers as reporters, at a number of locations around the world and is read by over 350,000 people. Stars and Stripes also serves independent military news and information to an online audience of about 400,000 unique visitors per month, 60 to 70 percent of whom are located in the United States. In 2009, "Stars and Stripes" launched the blog "Stripes Central" from the Washington, D.C., bureau. Content is written by the Washington bureau's reporters: Leo Shane III; Kevin Baron; Jeff Schogol; and Megan McCloskey[needs update]]]. Stars and Stripes is a non-appropriated fund (NAF) organization, only partially subsidized by the Department of Defense. A large portion of its operating costs is earned through the sale of advertising and subscriptions. Unique among the many military publications, Stars and Stripes operates as a First Amendment newspaper and is part of the newly formed Defense Media Activity. The other entities encompassed by the Defense Media Activity (the Pentagon Channel and Armed Forces Radio and Television Service, for example), are command publications of the Department of Defense; only Stars and Stripes maintains complete editorial independence. Stars and Stripes is in the process of digitizing its historic editions. Newspaper microfilm from 1943 to 1999 is being restored and rendered into searchable format by Heritage Microfilm and integrated into an archives website. Newspaper Archive makes a 50-year run from 1948 to 1999 available. ↑ "Site Map". Stripes. http://www.stripes.com/site-map. Retrieved 2013-02-27. ↑ "Contact Us." Stars and Stripes. Retrieved on October 12, 2010. "529 14th Street NW, Suite 350, Washington, D.C. 20045-1301." ↑ "Starsandstripesmuseumlibrary". Starsandstripesmuseumlibrary. http://www.starsandstripesmuseumlibrary.org/. Retrieved 2013-02-27. ↑ "1918-1919: A Talented Editorial Staff". The Stars and Stripes. Library of Congress Serial and Government Publications Division. American Memory. http://memory.loc.gov/ammem/sgphtml/sashtml/staff.html. Retrieved August 28, 2009. Wikimedia Commons has media related to Stars and Stripes (newspaper). Stars and Stripes Museum/Library Association, Inc.